I want to invite you to travel with me to Palestine in 28 A.D. Let's listen to a conversation between two Israelites named Benjamin and Abda. Benjamin: "I cannot believe the moral and social decay that has occurred in Palestine since the Romans took control! This was a godly nation! Nothing has been the same since Rome took control. Everywhere I look I see evil." Abda: "Things have changed incredibly. Without question we see evil everywhere we look. It's true that nothing is the same, and I doubt that it ever will be the same. But, Benjamin, I can still see God working." Benjamin: "And Herod decided that he would rebuild our temple! He started that project 9 years ago. All he has done is make a mess and disrupt the city! The priests are so preoccupied with rebuilding the temple that they don't have time to be priests! All Herod is doing is glorifying himself. Jerusalem has just not been the same since Herod started his temple project." Abda: "What you say about the rebuilding project is true. Things are a mess, and Jerusalem is not the same. Everybody knows everything Herod does is to promote himself. But still, I see God working." Benjamin: "And this new teacher who spends most of his time in Galilee, this Jesus fellow. All he does is stir things up. As far as I am concerned, he creates a lot of confusion. I don't think that he does anything worthwhile. He has all the common people and all the wicked people all worked up with his teachings. Everywhere he goes with his miracles he generates hysteria. It is all a bunch of showmanship and emotion. I have not heard a single lesson that he taught that emphasized the importance of synagogue attendance, or the necessity of temple sacrifices, or doing the right things the right way. He never talks about tithing or the temple taxes. If people listen to him, all Judaism will fall apart. He never teaches on the important things!" Abda: "Jesus certainly causes a lot of excitement. I have never seen common people so excited about God! In fact, I have never seen common folks so interested, so willing to listen. Nor have I ever seen the priests, the rabbis, and Pharisees so upset. But I still tell you, Benjamin, I see God working." God is working right here right now. Do you see Him at work? "We are doing some things in ways that we never did them before." Can you see God working in what we are doing? "The elders really expect us, as a congregation, to participate in decisions, and that is different." Can you see God working in that? "But, whatever we do, it will happen because we as a congregation decided for it to happen." Tonight, as a congregation, we take one of the most important steps this congregation has taken in its seventeen years of existence. Tonight we select seven people to serve as our screening committee. Will receive nominations for men to be considered as additional leaders. Will present qualified men to us as a congregation for our consideration. This is step number one in the process of adding additional elders, additional shepherds, to our congregation. Last October I taught a series of lessons on leadership profiles in the New Testament. We looked very carefully at the profiles in I Timothy 3, Titus 1, and I Peter 5. We noted that the leadership needs in the congregations at Crete (Titus 1) were different to the leadership needs in the city of Ephesus (I Timothy 3). 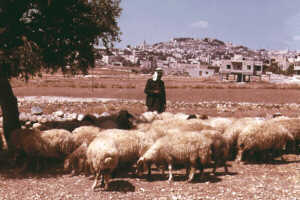 We also noted that the basic responsibility of elders is to "shepherd the flock" (I Peter 5). With care and love, they unselfishly lead the flock. They do it by being examples who care about the sheep, the people. They do not use the power and control of a lord. In that series of lessons I wanted to increase your awareness of the full teaching of the New Testament concerning congregational leaders. The men who lead a congregation as its shepherds must have a spiritually mature foundation. Each man must have a living faith that allows Jesus to direct his life. Each man's life must produce the fruit of the spirit--love, joy, peace, patience, kindness, goodness, faithfulness, gentleness, and self-control (Galatians 5:22). Each man's life must demonstrate the Christian graces: faith, moral excellence, knowledge, self-control, perseverance, godliness, brotherly kindness, and love (2 Peter 1:5-8). These men will also fit the profiles of 1 Timothy 3, Titus 1, and 1 Peter 5. They will be men of spiritual experience in whom God's word lives, who know how to guide others by the teaching of the Bible. They will have healthy, loving relationships within their families, relationships that bring them love and respect from their families. They are men who genuinely love God and love people. They use their lives and the warmth of their homes to minister to and encourage others. They are kind men who control themselves, who live consistent lives, and are respected even by people who are not Christians. They are men of courage, men of vision, and men who are flexible. All the terminology regarding the elders, or bishops, or pastors (all words that designate the same leaders) are rooted in the concept of a shepherd. That is very understandable because they are to work with people in the same manner that Jesus worked with people, and Jesus was the good shepherd. In John 10:1-18, Jesus said of himself that he is the good shepherd. He knows his sheep and they know him. He knows their names and they know his voice. He responds to their needs and they respond to his leadership. He laid his life down for his sheep--he was more concerned about the needs of the sheep than about his own well being. In Luke 15, he gave us a beautiful picture of the kind of good shepherd that he is, of the kind of good shepherds elders will be. A shepherd counted only 99 in his flock when there should be 100. One sheep did not listen to his voice; one sheep did not follow; one sheep was lost in the wilderness and faced certain death. This shepherd did not conclude that he still had 99, that the lost sheep was stupid and troublesome, and that a 1% loss was quite acceptable. He left the 99 secure, searched in the wilderness until he found the lost sheep, and carried it back to the flock. He rejoiced because he found it; he did not curse because of the trouble this stupid sheep caused him. Matthew 18:13 said that the shepherd rejoices more over the lost sheep he found than the 99 that were secure--and adds that is exactly the way God feels when He recovers someone who has strayed away. 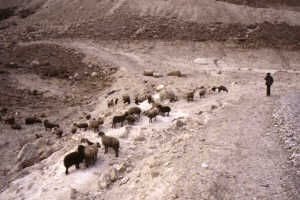 I Peter 5:1-4 urged "the elders among you" to "shepherd the flock of God" by being "examples over the flock." It encourages them by assuring them that Jesus, "the Chief Shepherd," will reward them with an "unfading crown of glory." Men qualified to be elders have the heart of Jesus and the heart of God. Think about some things that are so obvious that we may not see them. What is a shepherd? How do you know that you are looking at a shepherd? For a moment, join me on a tour bus as we tour the southern region of Israel. Before we started touring the region, you told the bus driver that you really wanted a picture of a shepherd. The bus driver said, "When you see a shepherd, holler." Will you holler when you see a man with a backpack hiking across a hill? Will you holler when you drive through a town and see a police man directing traffic? Will you holler when you see a foreman directing construction? There will be only one scene that makes you holler. You will holler when you see a man leading and caring for sheep. As you consider men that you wish to suggest for elders, first ask yourself, "Are they caring for sheep?" We need to appoint good men who know how to shepherd because they are already caring for sheep. We live among people who are bruised, bleeding, broken, disillusioned, skeptical, and bewildered. Let's be honest--we don't just live among such people; we are such people. Do you know a frustrated parent? Do you know a child in despair? Do you know a deeply troubled home? Do you know a broken home? Do you know a single parent home? Do you know someone who is devastated by a death, by serious illness, by a moral crisis, by loss of a job, by financial ruin, by injustices, by enemies who despise them? Oh, yes! In the church, out of the church, everywhere. What do these people need? They need a wise, loving shepherd who has the heart of God. What do each of us need? We need a wise, loving shepherd who has the heart of God. We need someone to guide, to listen, to encourage, to pray with us, to cry with us, to challenge us, and to lead us. We need someone we want to listen to and want to follow because we respect that person, trust that person, and know that person truly loves and cares about us. We need shepherds. Jesus, the Chief Shepherd, intended for us to have shepherds. As a Christian family, two things must happen. We must give our shepherds the opportunity to be shepherds. We desperately need to change our expectations of our elders. Congregational expectations force elders into roles of financial experts, architects, business advisors, a governing board, repair experts, insurance experts, and on and on. We expect them to do a thousand things well, a thousand things that Jesus and New Testament writers never had in mind for elders. Our shepherds desperately need to delegate, and do it in good conscience. We are blessed with talented, capable people who have expertise in finances, buildings, business, administration, repairs, and the thousand other things that legitimately need to be cared for well and responsibly. Let's create expectations and a climate where the elders can feel good about delegating. Let's rejoice and encourage our elders when they serve as Christ intended, when they shepherd with the heart of God. The first hands that a lamb feels when it is born are the hands of the shepherd. When it is weak and cold, he carries it. The first help that sheep receives when it is injured comes from the hands of the shepherd. He doctors it and helps it. The first voice that a sheep hears when it is lost is the voice of the shepherd. He is searching for it. The shepherd leads; the shepherd helps; the shepherd carries; the shepherd rescues. For all those reasons, shepherds always smell like the sheep. There is a Shepherd that loved us so dearly that He died to protect us from death. He knows every difficult circumstance and every lonely moment. He can address your needs, whatever they are. He wants to be your Shepherd. He will not stop at anything that is in your best interest. He is bigger than life, even bigger than death. Do you want to be a part of His flock? His name is Jesus. Do you want to belong to Him? Do you follow Him? The Shepherd's voice calls.